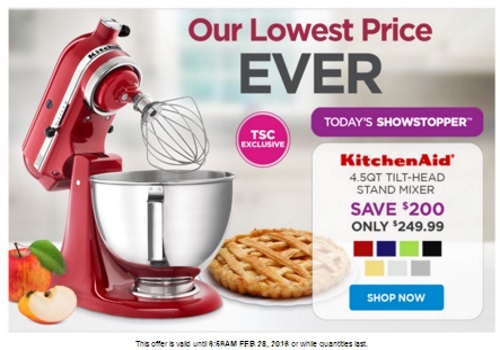 The Shopping Channel has their lowest price ever on the KitchenAid 4 Sqt tilt-head Stand Mixer right now! Get it for $249.99, which is $200 off the regular price. This is a today's showstopper deal and is only available for a limited time and with limited stock. Offer ends 6:59am February 28 2016 or while quantities last. Click here to browse this deal on The Shopping Channel.